Is Grants Pass Oregon Family Business Friendly? The obvious and resounding answer is most emphatically no based on experience. While I have spoken with an understanding mayor and community development director, the fact remains the way my family business has been treated by this city as well as the chain of events that led up to our being required to move my business out of my "out building" is utterly ridiculous. This started with an anonymous complaint that we are blocking our driveway. This was never properly investigated as per even the community development director. Instead a person who in my opinion would work well within the old Soviet Union sent me a 7 day cease and desist order (since we are in vacation season, I could have been gone too, so Really, 7 days, who are you kidding, Putin maybe?). I checked with my neighbors and none had any complaints which makes this all the more suspicious of why the attack on my business (especially since Grants Pass has been less than friendly toward my business since day one and since we have a trouble maker in California who looks for any way to harass and threaten our family including false reports to DHS). 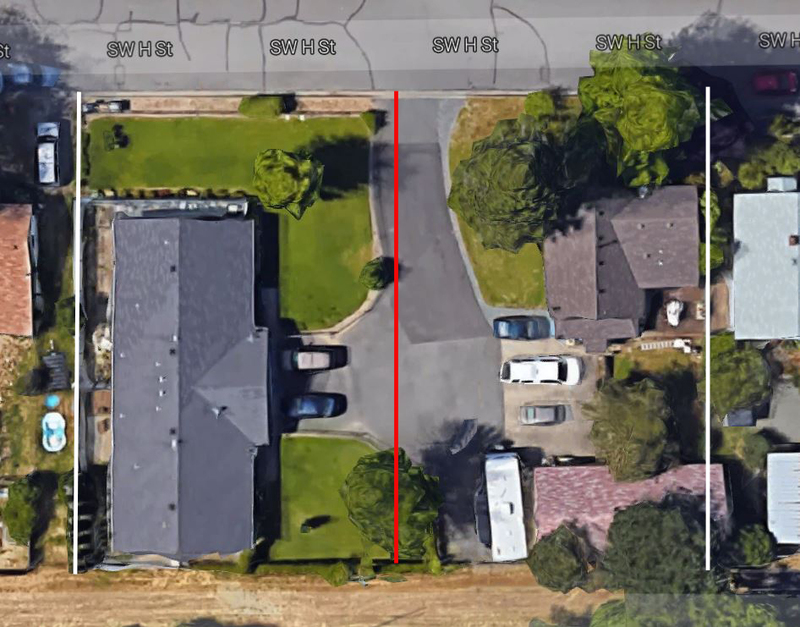 Even more of note is we own the entire drive all the way to the street, the house next door in the duplex have an easement ALLOWED BY ME. So the fact remains is I can park on my own driveway if I want. 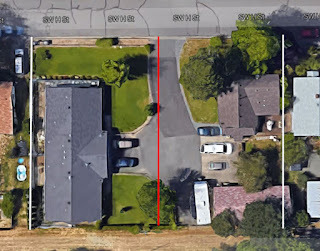 The red line in the picture above clear shows that the vast majority of the driveway is on our property (and then some). When Fedex trucks dropped off, they were there but a short time and never were on our neighbor's property, but our corrupt city government could not even do the most remedial of research or even return emails but for one person. However this evolved into where number #5 in the city charter that does not allow for any persons to work at the business who does not reside there. While I can understand this, I also have to point out that many businesses across the country and even here in Grants Pass have a few employees that come and go or work some regular hours in a residential area. My 4 employees work part time at the residence and part time out of their own homes. The part time here is due to getting orders ready for our internet based business. The home time is writing computer code, pictures, articles, and a lot of customer service. It is noteworthy that we are well within compliance of 9 of 10 city requirements for a city business operating out of a home or a building on the residential property. In speaking with others, along with the fact many businesses here in Grants Pass work out of homes, garages, and have employees on the premises, this begs the question of the intent or spirit of the law. Does one get a ticket for going 56 in a 55 mph zone? No, not usually unless we are dealing with a power hungry officer, but we certainly would deserve a ticket for going 75 mph. When you consider the fact we are well within every other aspect of the code, and by a wide margin (such as not allowing customer traffic to our business, nor having any business vehicles parked at or near the home), any reasonable person would come to the conclusion that some sort of witch hunt is in progress by persons or at the very least persons in the Grants Pass City government need to step back and look at what they are doing. Another noteworthy point is many businesses have started out in garages or homes such as Amazon, or YouTube. These had employees as well and frankly when one considers how hodgepodge the zoning is here in Grants Pass, again a reasonable person has to say REALLY, is this the kind of anti small business Grants Pass wants to foster? One more noteworthy point is this neighborhood has mixed businesses within it. Only three lots away was a Boathouse business that has since burned down. There also is a video store, an industrial business and more within a few blocks, ALL mixed within this same residential neighborhood. Other examples even include the web site "I Love Grants Pass" which has employees on the premises. As well as a tattoo parlor, a taxi service and a barbershop are also run out of a building on residential properly on our street. So this begs the question as to one very minor violation on the city charter (#5, when our business is well within compliance on all other points), as to the intent of this charter "is to maintain residential integrity" when these other clear businesses are clearly NOT maintaining residential integrity, while our business is quite the stealth business being a computer based family business with a few employees coming and going being the only clue that there might be a business on the premises. Even more to the point, after spending some time reading the Grants Pass City web site and the many pages and pdfs with rules and ordinances for business, building, etc. ; no where can this obscure rule #5 be found. Does this mean it does not exist? No, but the fact it is not published adds to the suspicion that this obscure rule is being used as a tool for very immoral attack on our business by someone in the City Government or a tool using our City government. IN OTHER WORDS, MORE PROOF A CLEAR WITCH HUNT IS UNDER WAY BY THE CITY OF GRANTS PASS!!! Below is a recent picture of our home with the building in the back where I run my business partly out of, although much of the work online is down inside the home up front by me and and my daughter, as well as at the home of my employees online. DOES THIS LOOK LIKE IT IS AFFECTING THE RESIDENTIAL INTEGRITY OF THE NEIGHBORHOOD?? In speaking with Tod Harrison, who was the person in the City government who filed this complaint WITHOUT ANY RESEARCH, and whom took the leap from blocking a driveway to employees at the home (which are clearly separate issues), he did concede to 30 days instead of 7, however in the time we have been spending valuable time that should be going into running a business, we have quickly realized that even the most remotely affordable and useful facilities are 60 plus days from occupation. More importantly; Tod Harrison called me back a little later telling me in the mean time to not park any extra vehicles in the driveway. REALLY? First when employees do come by, they park in the street, BUT MORE IMPORTANTLY, this is 100% my driveway and WHO IS THIS MAN TO TELL ME WHERE I CAN AND CANNOT PARK ON MY PRIVATE PROPERTY!!! If this does not tell you where this man is coming from, I have some beach front property to sell you in Barrow Alaska!! Everyone I told this point dropped their jaw and stated I SHOULD NOT TAKE THIS LYING DOWN AS I HAVE prior to writing this blog post! Frankly, this man should be in the unemployment lines as he is trying to do with me, except that with me being privately employed, I cannot get unemployment! In the mean time, we are having little success in finding something that will both work and we can afford. Believe me, we would love to expand and business was growing until the USA voted that clown into office in Washington DC who also allows his buddies at Google to monopolize the internet. But I would be willing to bet that these persons in Grants Pass government think Google is the greatest thing since sliced bread and only help exacerbate the situation by using their crap search engine instead of the moral and frankly better ones such as DuckDuckGo.com. Maybe then we would be growing like we were with our extremely unique aquarium and pond information articles, instead we have to constantly spend copious amounts of man hours and money promoting our business either with terrible Google Adwords, forums where persons can be very vile toward my staff, Facebook, and many more outlets. Now we must take on another expense when we can least afford it, at a time when my Doctor wants me to get more staff so I can cut back on hours do to health problems (including scheduling back surgery). Of course this will not happen now; THANKS Grants Pass!!!! I should note that it is interesting that I get positive feedback from many persons for my many free and in depth articles world wide, yet I get nothing here in Grants Pass (with a few exceptions). This includes "getting talked around" in Grants Pass forums (which I have since left), the Courier (who we were advertising with at the time) ignoring my expertise about fish care and poisonous fish when they did an article many years ago and then getting their facts WRONG. Interestingly, one of these GP forums is run out of a home where employees outside the residence work. I am sorry to bring up the past, since I have long ago moved on and promoted my business elsewhere where we are appreciated, but when ridiculous city orders such as this are presented, REASONABLE PERSONS have to question whether there really is something going on more deep? What is also sad about this attack on my business by the City of Grants Pass is the economic FACT that the best kind of business to have is one that employs persons while bringing in money from outside the community, which 99.9999% of the money we bring is not only from outside Josephine County, but even some is from outside the USA. But I am guessing many working for the Grants Pass City government have no understanding of basic economics. As of now, I am still looking in trying to turn a bad situation into good, but this is so far not going well. Others have stated I should seek legal counsel and work to get Tod Harrison fired for his alleged misguided attack on our business, but for now I am still trying to work within the system and hopefully honest persons will step forward and fix this problem, but I am not holding my breath. I will state that the mayor was very understanding, but I get the feeling his hands are tied. As well the Community Development Director was also more reasonable, he for one has extended it to 90 days (but this is not looking as easy as I thought). I get the impression that he too has his hands tied and that since Tod Harrison filed this order, it cannot be rescinded unless the City Council steps in. I have been told to contact my City Counsel members of my Ward or elsewhere, since they have the authority to fix the situation by better clarification of what the purpose of these ordinances are for, which is most certainly NOT to use as a way to anonymously attack others the way the DHS is also used. This is clearly what happened and now the City of Grants Pass has become the tool of another anonymous person to destroy a family based business. What is also making this more difficult besides my health issues and needing to cut back on hours, not take on hours to cover letting go staff to pay the extra expenses the City is forcing me to incur is the fact this comes at a difficult time for my family with the loss of my wife's sister (whom she was very close to). So thanks too to Grants Pass for this show of compassion!!!! Hopefully I can edit this article to a more "happy ending" (or delete it), but it may have to go the other way. 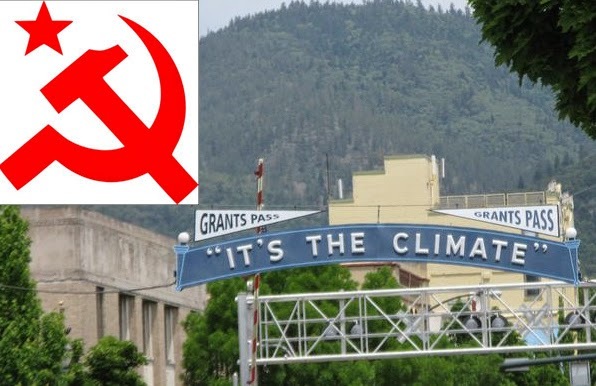 Either way since I know this blog is well read, I am hopeful that this will warn others thinking of moving a business here, or better, get the honest persons in Grants Pass to rise up and say "NO MORE!" After investigation, reading laws online, speaking with neighbors, and speaking with a City Council member, it is quite clear that Lawrence (Larry) V. (of CENTURY 21) allegedly made this complaint where by he provided false information and made false charges. False information since the City clearly thought that the drive was split down the middle and that he had permission to park on the driveway when IN FACT the property line included almost the full main drive on my property (as I showed to a City Council member), as well as THE FACT Lawrence V. only had an easement from me for ingress and egress. This was a false complaint since there was no blocking of the drive way), EVER as per my neighbors too. A FedEx/UPS truck that delivers cannot be counted since we and our neighbors still receive deliveries and the onetime a neighbor needed to leave, the FedEx truck that was dropping off a package immediately moved. Little has been done to this point. Sadly, for a community that has strong Christian ties with the many churches, etc., this speaks very poorly as per the parable of the Good Samaritan where those who can help are clearly acting as the Priest did in the parable by walking away. Currently this includes City Council Members whom I have contacted with ONLY ONE even having the decency of returning my emails. I also attempted to contact Lily Morgan via Social Media (besides email), she too could not be bothered!! The exception was Mark Gatlin (who will be the only one getting my vote or likely that of my family, friends, or employees). I did get some contact with the mayor who expressed sympathy, but was unwilling to do ANYTHING else than a "there- there". In the end, it is not just me who they will put out of work with their actions or lack there of, but my few employees (including those who work out of their home), and local businesses such as Grovers Electrical & Plumbing whom we purchase a considerable amount from on a weekly basis to build parts for aquarium filters and plumbing systems that are then sold worldwide! Thankfully in the end, a friend in the city found us an excellent location that allows my daughter to help and along with reasonable rent and the pay off of a loan, we should be able to make it here. This is definitely a case just like an issue with the Oregon DHS where other meant this for evil, but God has made good out of it with a much larger and workable location (albeit at much higher monthly expense that as of Jan. 2015, we have not been able to cover). Please call the city at 541-450-6000 and in your own words ask them to stop looking the other way while a City employee uses an obscure law to attempt to shut our business down. Please call every day until they cease their attacks on our family business. The facts are there are much more offending businesses as to affecting the residential integrity of the area. The City Council could easily write a waiver or amend this obscure provision if they wanted to as well. As well, in my opinion, I would certainly never do business with a man like Real Estate agent Lawrence V., since he clearly knew our family was going through much with the loss/death of my sister and my health issues. So to pile on when I had done him a favor with the ingress and egress easement says a lot about his character. Now we have a sales tax proposal drawn up by unelected and thus job protected City Manager Aaron Cubic. Council President Dan DeYoung and councilors Jim Goodwin, Dennis Roler, Roy Lindsay and Rick Riker voted for the issue. Councilors Lily Morgan and Ken Hannum voted no. Councilor Mark Gatlin was not in the room, but he participated via Skype at times and via a cell phone at other times. He argued against the question, but apparently lost a connection just before the vote was taken. Once more Grants Pass in their misguided non-business friendly attempts to fix miss-management issues are willing to push businesses such as mine out of Grants Pass. What persons such as the City Manager & City Council with no business sense do not seem to grasp is that Grants Pass is a tough place to conduct a business that is not service related, in part due to the location and cost of moving product in and out in a cost efficient manner. What GP does have is a statewide sales tax free business zone that partly makes up for this and allows us to compete with the "big boys" in our industry who have advantages we do not have. Now the City Manager proposes to take away this one advantage we do have for having a business that brings in ALL outside money and employees persons with this money in a good job. Let me put it simply so that our City Council can understand; We operate on a thin 9% margin after cost of goods and expenses, after paying off the mob (the City of Grants Pass) we will now have a 7% margin. Put into dollars, a property tax levy will cost my family maybe $300 while this tax will cost my family $8000. Maybe the City Council can do the math here???? As for passing it on via customer service as one poorly informed council person stated on KAJO Aug. 4, we already provide the most in depth library of aquarium and pond information in the world, but most persons just take our help and customer service and shop price, so we MUST be in the ball park. This council person needs to wake up and realize this is the 21st century, not 1970 where customer service made a huge difference. Maybe he needs to look at salaries of highly paid city staff to fund the police and jails? I heard about this first through the grapevine, but after reading this I was appalled. Your City should be proud to have such an internationally well respected person such as yourself, the service you have done over the years for the aquarium/pond hobby are immeasurable. You certainly do not deserve this! If your mayor or city counsel members have even a shred of moral fiber, this will be put to en end immediately, then an internal investigation of the obvious corruption in your city government needs to start.